Pastry chef Leslie Liang is the owner of Milo’s Bonbons, based in San Mateo, California. Milo’s Bonbons began as a blog in 2010, inspired by Leslie’s pup Milo and cupcakes, two of the things that brought her joy during her high-stress time working at a law firm. From those early days of chronicling both her early baking contributions to the office and the adventures of Milo, the blog expanded into explorations of visual and culinary art. 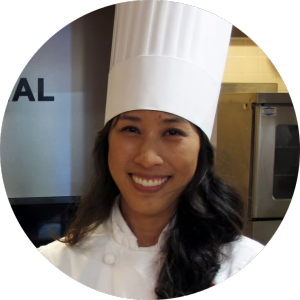 Leslie later trained in the Classic Pastry Arts program at the International Culinary Center in California, graduating Top of the Class in 2013. Since then, Milo’s Bonbons has catered birthdays, baby showers, weddings, office events, and other celebrations and gatherings. Generally serving the surrounding San Francisco Bay Area, Milo’s Bonbons also caters destination events upon request. Please contact us if you are interested in pastries at your next event (or otherwise want to meet Milo).